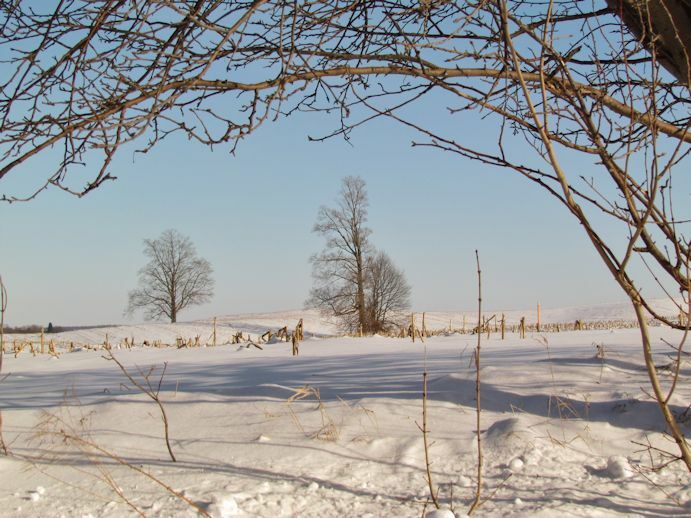 The following is the second in a series of winter day-tripping ideas from Diva Shari Parsons, who has a special passion for driving adventures, trail hiking and photo opportunities. Recently, my hubby had a week’s holiday but since we couldn’t “get away” we decided to enjoy some of the local attractions. There is the saying “a change is as good as a rest” and even one night away from home feels like a mini holiday. We decided to use some travel reward points to book a Jacuzzi King Suite at the Dreamz Inn on Hwy. 21 between Goderich and Bayfield. We had stayed there one night last winter and enjoyed the experience so we decided to do it again. After checking in, I swam for an hour in their clean, saltwater pool while my hubby alternated between pool, dry sauna and hot tub. We ate a picnic style supper, which we had brought with us, while watching TV on their good-sized flat screen TV. We ended our evening by snacking on potato chips while sharing a romantic soak in the large Jacuzzi tub in the firelight of the electric fireplace. The King bed was comfy as were the downy soft sheets. In the morning, my hubby skipped down to the breakfast room to grab some free breakfast munchies while I enjoyed another soak in the Jacuzzi tub. When he came back we enjoyed blueberry muffins, yogurt and tea. The sun was shining and the temperature was mild so after checking out of the hotel, we decided to go for a hike at Naftel’s Creek Conservation Area on Hwy. 21., just south of the Dreamz Inn. The Conservation Area’s entrance is on the east side of the highway. It is not well marked so you need to be looking out for it. The parking lot has a fair amount of space. 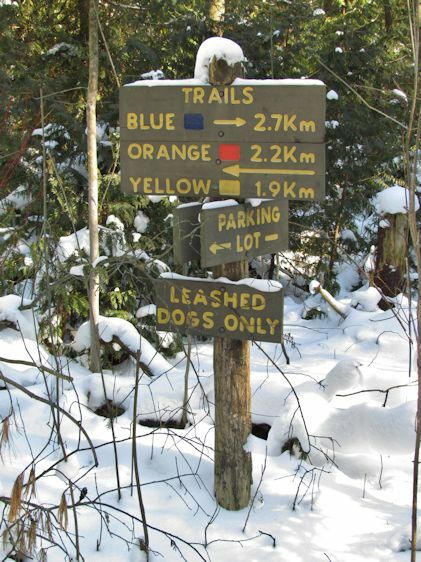 The trail is popular with people walking dogs and cross-country skiers in the winter. The main trail is fairly flat and winds its way through evergreens, hardwoods and cedars in wetland areas so there is a nice mix of environments and eco systems. There is a pond and a couple of tinkling creeks. 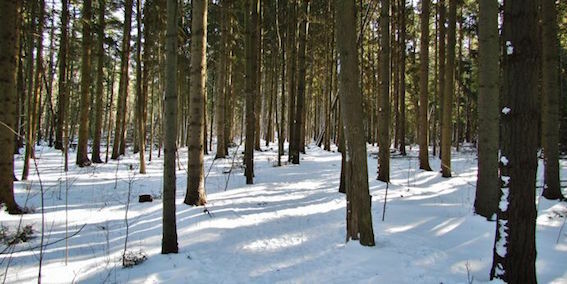 The beginning of the trail runs through a conifer plantation. Recent windstorms have toppled a few of the trees and you can see how wide but shallow the root system is that anchors these tall trees. You can tell by the tracks in the snow that the uprooted tree bases make for great shelter for the forest creatures. 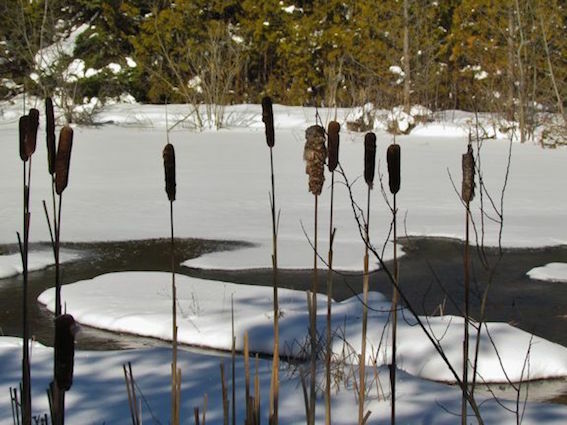 Boardwalks lead you through mini forests of cattails in the wetlands as well as over bubbling streams, the edges of which are marked by deer tracks coming to the creek for a drink. There had been a snowfall the previous day so the woods were covered in a fresh blanket of puffy white. Some tree stumps sported puffy caps making them look like giant mushrooms. 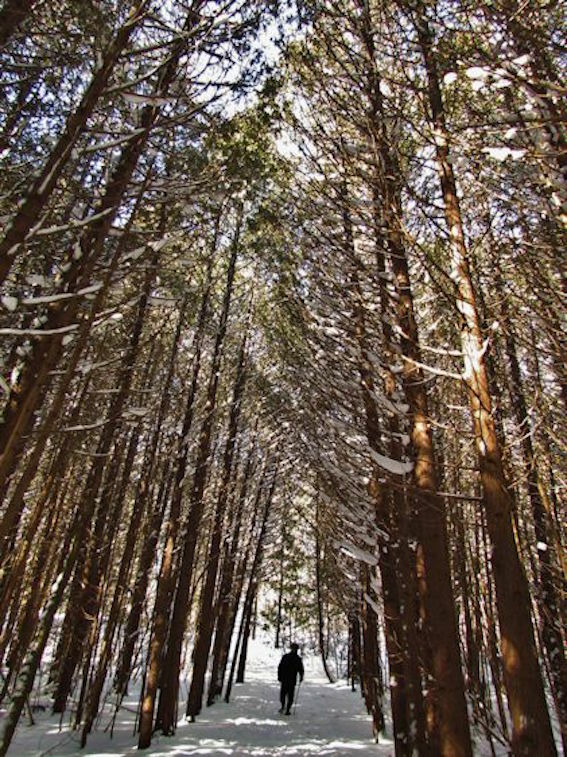 In the cedar groves, the trees on either side of the trail reach up and lean towards each other over the trail forming a natural cathedral ceiling and make the hiker feel like they are walking through a woody tunnel. 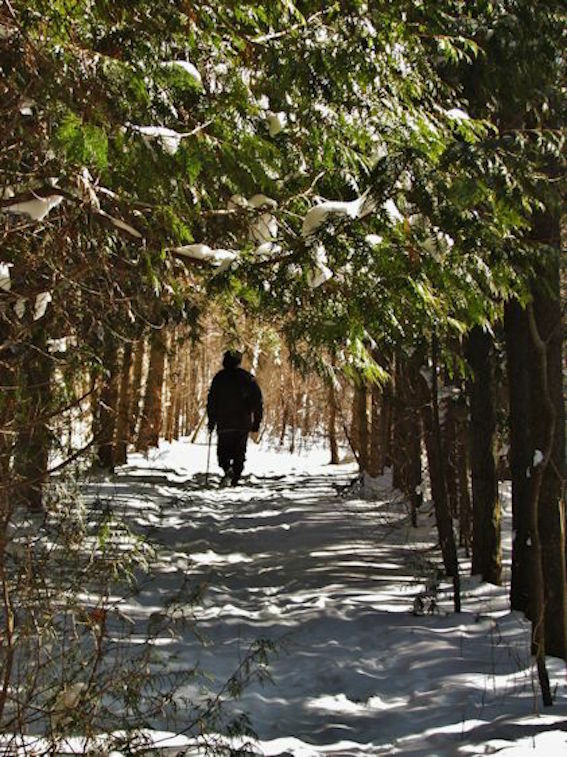 A winter hike on this trail is very quiet and peaceful with only the sound of the occasional chickadee. The weather was still sunny after our hike and we didn’t feel like ending our mini holiday by going home yet so we decided to go for a country drive. We once again headed north and did the Blyth Road to Auburn then Base Line Road route. 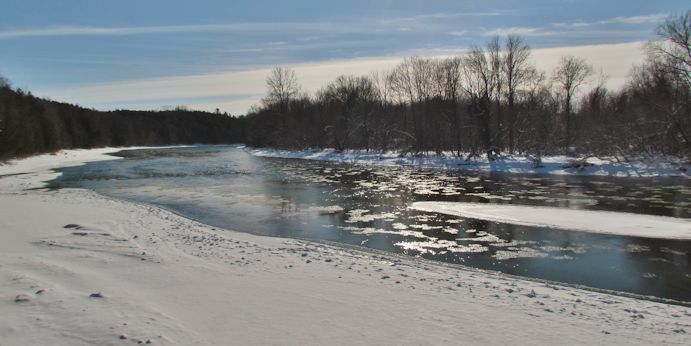 This time we decided to explore Maitland Block, a loop that cuts off of the Base Line Road and catches a portion of the Maitland River. It ended up that we weren’t able to traverse the whole road as not all of it is maintained in the winter, but on the way down, we watched a half dozen crows heckling a large hawk and soon saw the hawk’s mate following behind. On the way back up the road, I was looking at the tree-line and spotted a bald eagle sitting in a tree snacking on something. We got to watch it for quite a while before it majestically flew away. 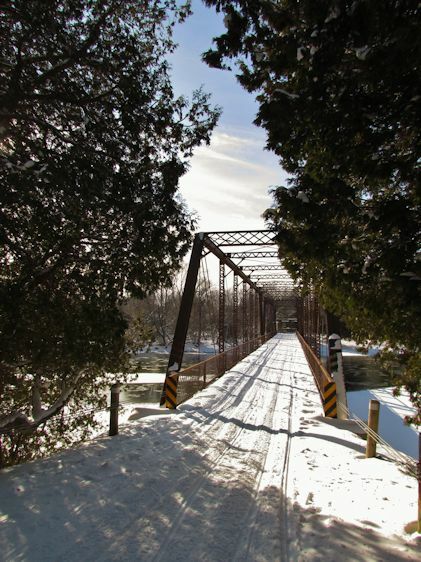 We pulled off the side of Base Line Road at Little Lakes Road and walked down the hill to the historic Ball’s Bridge as that end of the road is not winter maintained. Down at the bridge we noted another group of crows displaying incredible acrobatics as they were swooping and dive-bombing another hawk in a tree. 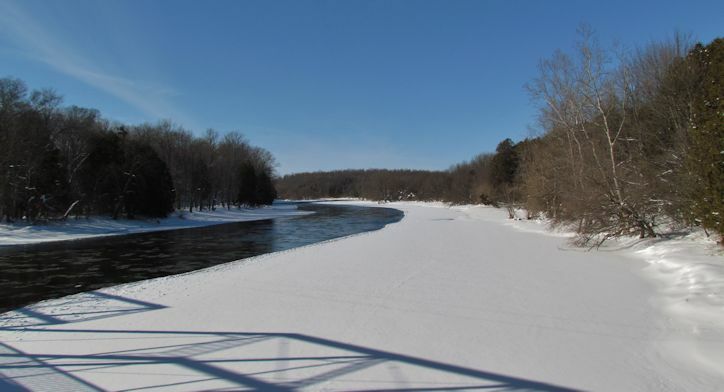 The icy edges of the riverbanks were covered with the wide-toed tracks of snowshoe hares. After walking back to the car (watch for snowmobiles as this is part of their trail) we drove to Londesboro Road. And then turned onto River Line Road. On one side of the road is an old brick building surrounded by antique farm machinery – an interesting contrast of textures and colours. On the crest of the hill, there is a large home resembling a fairy-tale castle, complete with rounded tower. 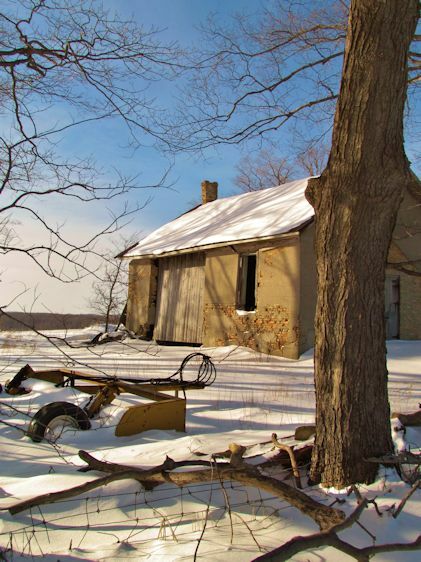 This home has an incredible view of rolling farmlands and woodlands to the east. River Line Road becomes Hills Road, (a good name for the location) which is dotted with Victorian farm houses. We then headed through Benmiller on our way home. 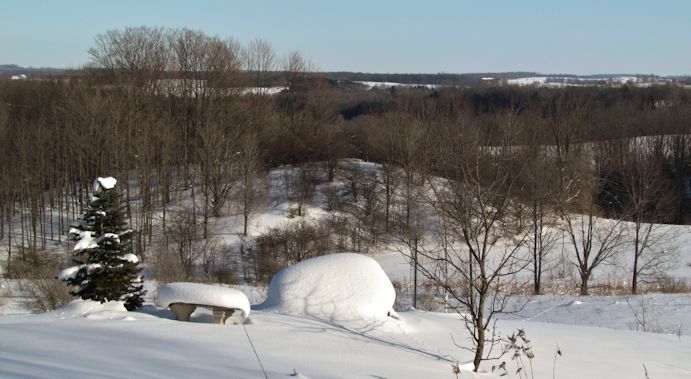 There is so much variety and beauty in Huron County that you don’t have to leave to enjoy a winter holiday. 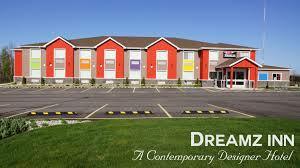 A contemporary designer hotel with luxuriously appointed rooms, with attention to detail. Non-smoking family atmosphere, with saltwater pool, fitness centre, outdoor lounging areas & multi-purpose court. Complimentary breakfast. 79272 Hwy. 21, at the intersection of Union Road and Hwy. 21. Between Goderich and Bayfield.